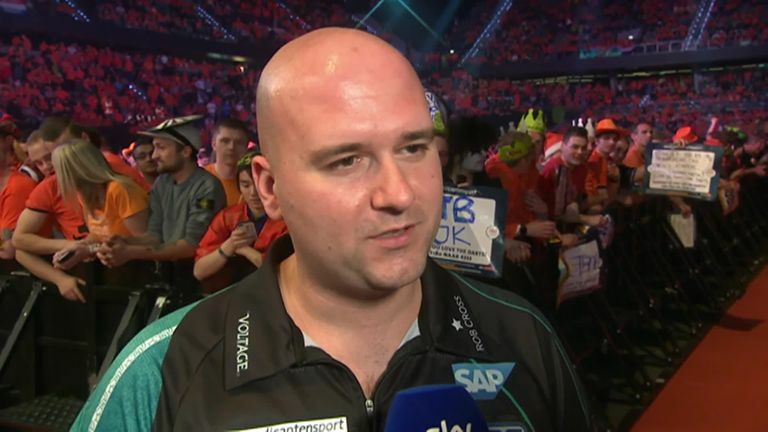 Rob Cross faces Peter Wright in Liverpool, as Premier League Darts continues on Thursday on Sky Sports Action from 7pm. Rob Cross is sitting pretty at the summit of the Premier League table as he plots a route to The O2 in London. 'Voltage' is off to a lightning-quick start in the 2019 season. He sits alone at the top of the table after Michael van Gerwen was held to a draw by Gerwyn Price in Belfast last week. The 28-year-old is enjoying his second season in the competition, after his stunning 2018 World Championship triumph catapulted him into the big time. "Coming in as world champion, I didn't know what to expect for the whole year," he reflected on 2018. "That was the biggest thing. "Now I don't worry. I go out, enjoy it, because I know what's coming. I know I'm going to spend time away from the family, I know I'm going to have to graft here and there. But at the same time, knowing what it's all about, it helps me greatly." "I go out, enjoy it, because I know what's coming." Cross certainly is rising to the challenge. Winning seven and drawing one of his ten games to date, he leads the way as the Premier League heads to Liverpool. He has been forced to dig deep while playing against crowd favourites in recent weeks, as he overcame Jeffrey de Zwaan in Rotterdam and beat Daryl Gurney in Belfast last Thursday. "I think I probably had it worse in Ahoy when I played Jeffrey," he smiled after his win over SuperChin. "[In Belfast], it was the same circumstances, the same crowd at first. "As soon as I hit the front, got a couple of legs in front, they sort of laid off me. Then you have to change your mental thinking and get used to that. "I'm really happy with the win. "I've been scoring big and doing the right things at the right times. Darts is all about timing. It's the only thing that separates number 128 in the world and number 1 or 2. So your timing has got to be right.."
Despite impressive form both in floor tournaments and on-stage in recent months, he is yet to win a title in 2019 and is keen to rectify that. "I think I've been consistent," he said. "Decent averages. I've been happy in myself, playing well. I still believe there's another gear or two in me to go. We're going to keep pushing and hopefully get that elusive first win of the year." Following his Merseyside date with Snakebite, he will face MVG in Cardiff, but 'Voltage' will know the importance of focusing on his battle with Wright. With six rounds left ahead of The O2, Cross is on 15 points, one ahead of MVG on 14. However, he is not overly concerned at present about the top spot, as long as he books his ticket for the play-offs in London with a top-four finish. "First things first, get qualified. Once you get qualified, then you can eye up the top spot. Next week, I think I've got Peter, then I've got Michael. It's one week at a time. I have to get results definitely if I want to top it." Asked if he has a target points total, he merely smiled: "No, not really. I just keep going until someone tells me I've qualified."